Much of reverent art history revolves around the great periods during the early ages of European culture. The Dutch, for example, brought in many influential works to the frontline, including the artists of the French and Italian Renaissance. Known for their artistically-infused culture, the Dutch hold the claim to an art network that has drastically changed over the years. As a testament to this idea of aesthetic evolution, Dutch sculptor Florentijn Hofman has, through his work, brought a certain levity and excitement to the world during this time of great modernization. Hofman was born in 1977 but is most certainly a man of the 21st century. Influenced by the Dutch artists who preceded him, Hofman specializes in art that reflects the strengths of connecting modern day art to the people of the world. Generally, Hofman’s work revolves around the concepts of childhood innocence and cheerfulness. Of all his toy-like works, Hofman’s “Rubber Duck” sculpture is undoubtedly the most famous. Representing a childhood icon, the giant Rubber Duck is a multi-sized, traveling inflatable built from pontoons and PVC, the largest of which is located in St. Nazaire, France. Stretching to a height of 85 feet at its largest, this floating sculpture has brought many smiles across the world. Hofman’s duck, as stated in his decription, “knows no frontiers, it doesn’t discriminate people and doesn’t have a political connotation.” As a result, Hofman’s message of peace and acceptance through art has never been clearer. The jovial and efferevescent smile of the duck is relatable to all, especially those of the current generation who sang along to the famous “Rubber Ducky Song” from Sesame Street. As an artist, Hofman has unified cultures through the commonality of his work. 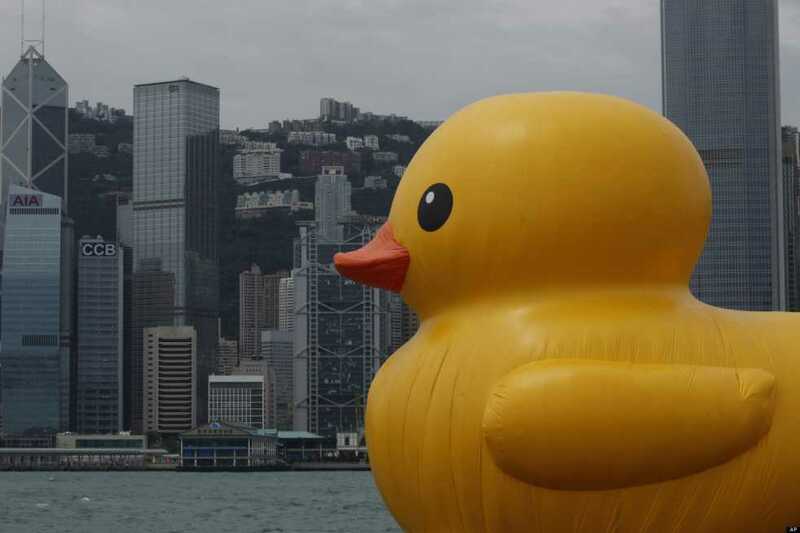 Hofman’s ducks have been swimming around the globe, from Hong Kong to Auckland to Pittsburg. Another child-inspired work is the “Big Yellow Rabbit.” This comically-placed bunny is located in central Orebro, Sweden. Leaning on the side of the founder’s statue, this 42-foot-tall statue replicates the feel of a fluffy stuffed animal. The use of childhood innocence is evident once more, as the bunny is in a dreamy state, looking up at the sky. Moreover, the constructed concrete and wooden bunny provides a level of comfort. All in all, Florentijn Hofman’s artwork unites the world with the modernization and globazation that is stretching across the planet. In a day and age when everyone is under constant pressures from life, the jolly sculptures of Hofman evoke a few smiles. Whether it is the bunny, the duck or one of the other of his myriad intriguing works, Hofman has sold the importance of art in an age dominated with technology and science.